The Digital Life of Tools Smoothing the Path to Industry 4.0 with Tool Lifecycle Management. Industry 4.0. Digital Manufacturing. Smart Factory. Even with respects to tool management, these terms are on everyone's radar. The modern factory is no longer conceivable without complex, interconnected IT. With TDM Systems, these developments are at the top of the agenda and are summarized under the new term "Tool Lifecycle Management". The machining industry is traditionally localized. On the one hand there are fully automated shop floors in which tool data management is fully integrated as a component of digital production engineering. On the other hand, there is a large number of plants that in many areas are still getting by with insular digital solutions. "According to studies, there are roughly a million plants in the machining industry today worldwide," said Adir Zonta, Product Manager at TDM Systems GmbH in Tübingen, which has been specializing in the management of tools for over 25 years. "Only thirty percent of them use CAM systems. 700,000 plants still do not use any CAM systems, but instead operate, for example, with manual CNC programming. All of them are potential customers for digital Tool Lifecycle Management. Through modern software concepts, the correct conditions can be provided to easily and economically launch into digital manufacturing." The advantages of Tool Lifecycle Management are obvious throughout all departments, every employee has access to the tool data, the feedback from the shop floor flows back to Development and is used for continual improvement of the planning. This is because digital manufacturing includes primarily the transfer of planning and tool data to the shop floor, which only works, however, if these data records are also made available to all those involved within the company and to its partners. Peter Schneck, Managing Director, TDM Systems emphasizes: "For optimum control of global processes, it will be necessary to build a bridge between one's own network and the networks of suppliers, partners and customers – this carrier system will be the Internet. This will make it easier to collect more information about the creation as well as the selection of the tools." The Tool Lifecycle Management approach taken by TDM Systems is to ensure that tool data is available at every level – right where it is needed – at any time. Data is virtual gold also in tool management. Whoever supplies the data is ahead of the game. 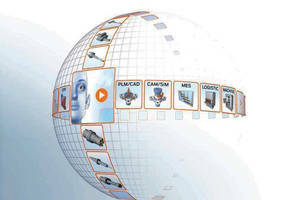 This knowledge is one of the fundamentals of the TDM principle because tool data management must be open, must supply numerous import and export interfaces and integrate data from various sources, such as from manufacturer catalogs or from 3D models created in house, into a management module. For TDM Systems the highest priority is therefore on the development of interfaces. "To link CAM systems, pre-setting and crib systems, and machine controls, but also at the planning and execution level, to PPS, ERP and MES systems," added Schneck. "Tool Lifecycle Management is an important contribution to Industry 4.0." Today TDM already offers multiple connections to various systems that support the production process. Only by closing the gap between planning and production is it possible to speak of comprehensive networking. However, one more important step is required on the part of the tool manufacturer. They must continuously adapt to international standards – with regard to the description of tools (governed by ISO13399) and their classification. Such a standardization would enormously help everyone with the integration of systems. "So far, the credo in our industry has been "Knowhow protection before openness," admits Schneck." Indeed, whoever wants transparency and comprehensive integration will have to be more open because only in this way a comprehensive Tool Lifecycle Management can be realized with the greatest customer benefit." Ultimately Tool Lifecycle Management makes the entire process the focal point…from the definition of the tools to their use in the planning to seamless transfer and use on the shop floor. Information from the individual process steps continuously flows back and improves the data permanently. This produces a growing treasure of data, which can be made accessible via a networked system. "The great benefit of the future vision of Industry 4.0," according to Schneck, "is that the shop floor shifts back into the focus of management's interest. Digitization and globalization sustainably change the production. Our thinking must shift in the direction of openness and networking. Tool Lifecycle Management is currently the most important step in this direction when it comes to tool management."